Because the lemon cream sauce is the main flavor carrier, you don't need to assertively flavor the salmon. No BBQ-basting cedar plank grilling here. You might like to use my friend Lasar's method of microwave poaching fish. 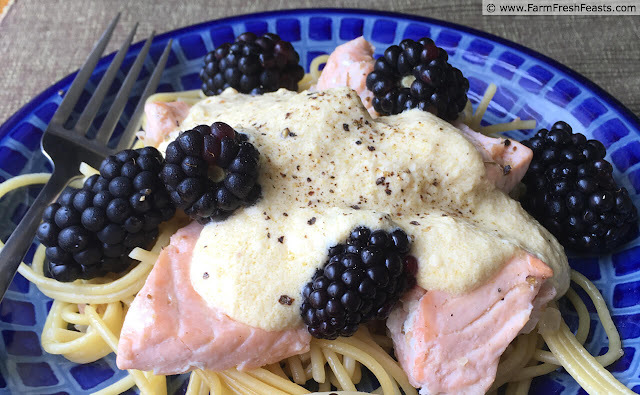 She just puts the pieces of salmon on a plate, adds a couple tablespoons of white wine, covers, and microwaves for a few minutes until the fish is opaque and flakes easily. We liked this over noodles. I prefer a wider noodle, like linguine or fettuccine, but spaghetti was fine. Get the pasta water going while you're cooking the fish so that when you're ready to start the sauce you're not doing much hands on with the rest of the components. If you're not into pasta, this would be lovely over rice, broccoli florets, or riced cauliflower. I am guilty of rushing my sauces, and I try to be mindful of slowing down to let a sauce properly reduce. In this recipe I let the lemon juice simmer for about 5 minutes and used the same amount of time for the half & half, so that when I added the cheese to the sauce it thickened quickly. Taking the time to concentrate the liquids in the earlier steps means the finished product is better. I had fresh berries, but I suspect this would work with frozen ones if you're not picky about the color of the final product. Sure, the thawing berries will bleed color a bit, but if that doesn't bother you go ahead and take the berries out to thaw when you grab the rest of the ingredients. Toss the mostly-frozen berries with the warm noodles before topping with fish and warm sauce. It should taste just fine. 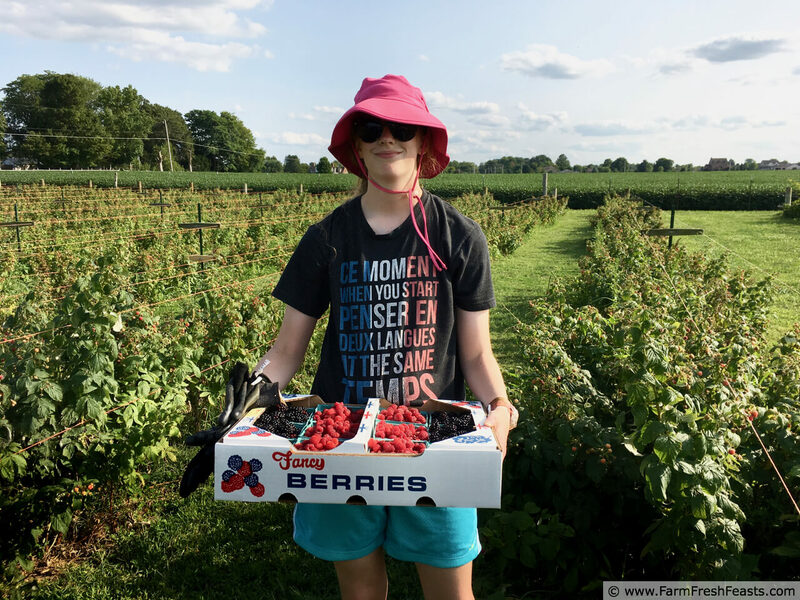 I haven't shared a blackberry recipe on this site yet--so I'm going to add this to the Raspberry Recipes Collection and hope for the best. My designer added protein categories, but they are not yet filled out in the part of the Visual Recipe Index by Ingredient, a resource for folks like me eating from the farm share, the farmer's market, the garden, the neighbor's garden, and great deals on ugly produce at the grocery store. 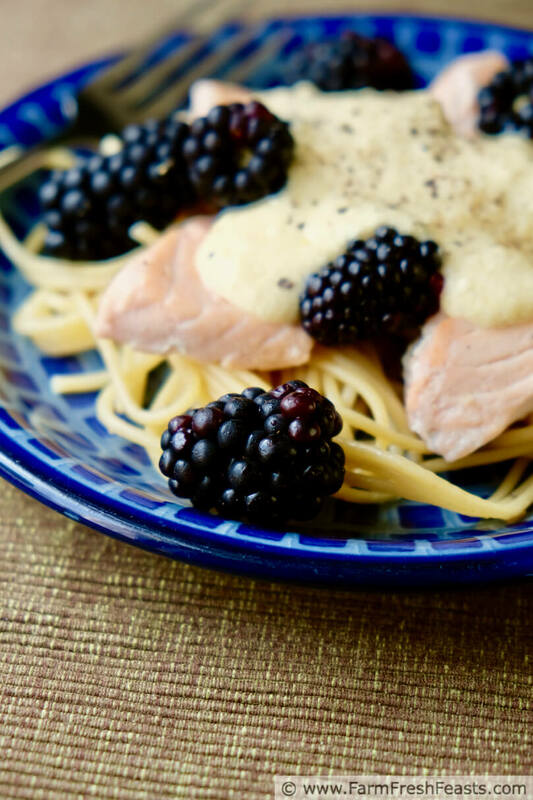 Notes: You can make both the salmon and the pasta ahead of time for this dish. For example, if you've got the oven or grill going for something else, feel free to add some lightly seasoned salmon and save a step for later. 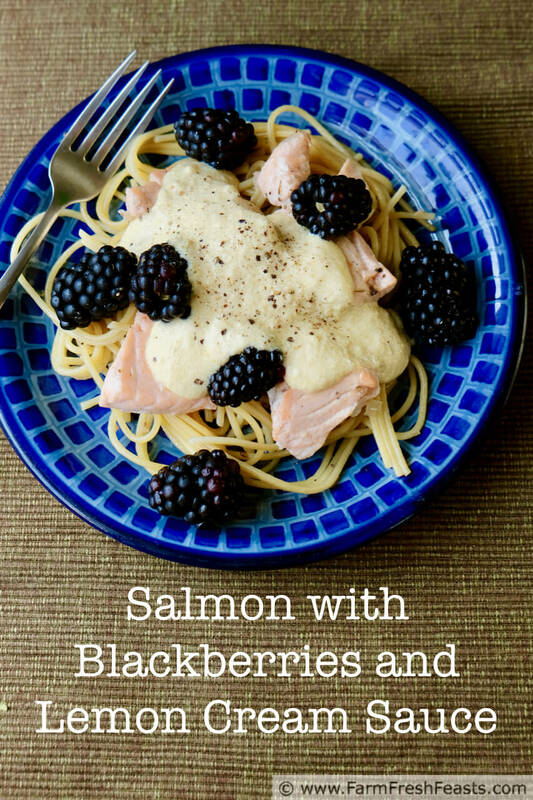 On the day you wish to eat let the salmon come to room temperature and pour boiling water over the pasta to warm it up. Feel free to swap in some rice, riced cauliflower, or broccoli florets for the pasta, and if you don't mind your colors running feel free to substitute frozen berries for fresh ones. 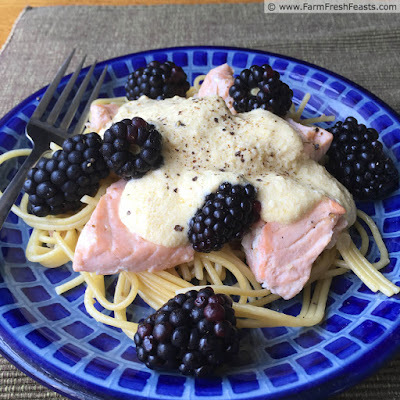 If you haven't cooked the salmon and noodles, get them going first. In a medium saucepan, melt butter and olive oil over medium heat until shimmery. Add lemon juice and simmer for 3-5 minutes until reduced. Beat half & half with egg yolks until combined. Pour into saucepan. Simmer 5 minutes. Stir in cheese and heat until thickened. Taste the sauce and add salt and pepper if you like, or have them on the table. Serve noodles topped with salmon, pour sauce over, and top with berries. You could substitute rice, broccoli florets, or cauliflower for the noodles.